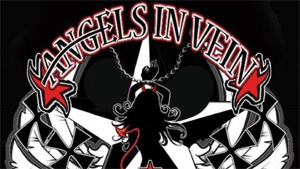 A new 'supergroup' called ANGELS IN VEIN has formed. The band is comprised of vocalist Chris VanDahl (L.A. GUNS), guitarist Todd "Taz" Anthony, guitarist Stacey Blades (L.A. GUNS), bassist Eric Stacy (FASTER PUSSYCAT), and drummer Troy Patrick Farrell (WHITE LION). ANGELS IN VEIN is a classic rock band with mainstream elements seamlessly woven into both its musical tapestry and cutting edge production, making its unique sound immediately identifiable yet virtually timeless. AIV's freshman offering is the culmination of a band who's independent and collective abilities have generated six gold albums, numerous billboard singles and millions in record sales worldwide. This is ANGELS IN VEIN. Check out a brief video teaser, featuring the band's first single "1973" and check out ANGELS IN VEIN on Facebook HERE for further details.